One of the most important features of superheavy nuceli (SHE) is the appearance of an "island of stability" where shape and shell deformations are expected to counter-balance Coulomb repulsion and lead to unusually long-lived nuclei. The island of stability and its boundaries are unexplored territory, and much effort is dedicated to reaching this Terra Incognita. As a precursor to SHE, expected at the N=162 subshell closure, hot- and cold-fusion reactions were used to create nuclei near the N=152 deformed shell, around Z=100. 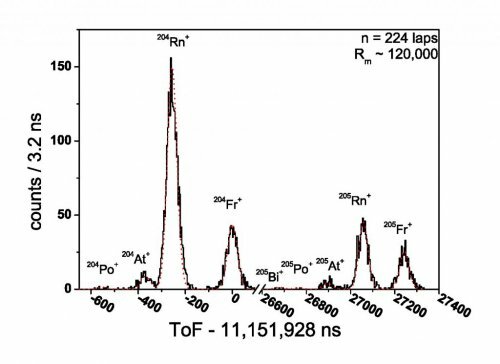 Masses of 246Es, 251Fm, and the transfermium nuclei 249-252Md and 254No, were directly measured using a novel multireflection time-of-flight mass spectrograph. The masses of 246Es and 249,250,252Md were measured for the first time. The mass and identity of SHE can be determined via anchor points, located at the end of sequential decay chains and our recent measurements of Md and Es provide anchor points for several SHE, connecting them to the nuclear mainland. Elements measured during the recent campaign (outlined in red), and the hot-fusion island (outlined in blue), with alpha decay chains leading to anchor points, or ending in spontaneous fission. During the 2016 campaign at the RIKEN SHE-Mass facility, IPN collaborators participated in experiments resulting in over 80 isotopic mass measurements, gaining precious insight to methods and techniques for future SHE studies at the national facility in GANIL, Caen, partly being prepared at ALTO. Results include very first measurements of 6 transuranium elements and more than 30 first direct mass measurements. All previously known masses agree with Penning trap data, while a few discrepancies have been found with older, indirect measurements. Extremely short-lived Ra isotopes (T1/2≈10 ms) were determined with a relative precision of 2 × 10−7. Time-of-flight spectra observed using 169Tm(40Ar, X) reaction at 5.16 MeV/nucleon. The Rn peaks are more intense those of Fr, despite the chemistry of Fr and Rn being such that Rn should be more likely to neutralize than Fr . Rn is created through p4n, p3n sequential decays, whereas Fr results from 3n and 4n decays. At a lower beam energy of 4.825 MeV/nucleon the situation inverses, with Fr peaks dominating over Rn production . All of the inhabitants of the hot-fusion island are detached from anchor points, and this leaves some uncertainty in even the identity of the island’s inhabitants. Therefore, in the already approved follow-up campaign, the MRTOF-MS will be used to identify both element (Z) and mass number (A) by precise measurements of hot-fusion evaporated recoils of SHE. 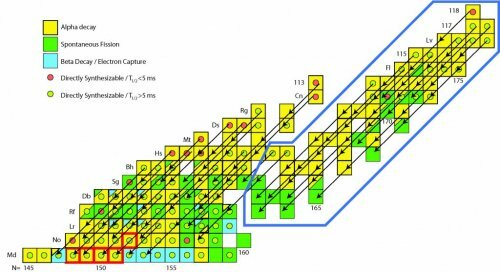 The aim is to produce 288Mc (Moscovium, Z=115) which should alpha decay to 284Nh (Nihonium, Z=113), both of which will be directly measured. These direct mass measurements will not only be used to anchor hot-fusion SHE creation but also for nuclear physics, in particular for more accurate predictions of the boundary location of the island of stability. The production of 278Nh at RIKEN-RIBF was achieved by the use of a cold fusion reaction, with evaporation recoil nuclei generally proceeding through multiple neutron decays (xn). When going from cold- to hot-fusion reactions the decay sequence has been seen to start with an initial proton decay (pxn) , and in these future experiments the dominant decay modes will be demonstrated.